It's that time finally- release time with The Cat's Pajamas and that means a fun, inspirational blog hop to get your creative mojo flowing with all the items you cannot live without in this release. :) If you have come from Wendy's blog, you are in the right place. If not, be sure to start at Nancy's blog. Today also marks TCP Tuesday Anything Goes challenge. 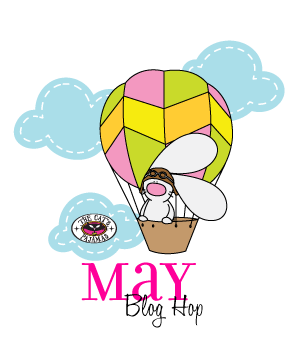 (TCPTUES291) This past week was full of fabulous creations by the Cat Pack and if you happened to miss any of it, be sure to check out the TCP Blog to see each day. For my card, I am using the new set of Constellation Prize which is stamped and fussy cut out to be popped up. The frame is from the new Stitched Fly journal card frame die with the word 'fly' cut out so just the frame portion can be used. With the same die, I used one of the clouds to be popped up in the top corner. The image was colored in with Copics and popped up. It was finished with some rhinestones. There are so many cute and fun sets in this release that I am sure it will be hard to choose which ones you want. But that is why TCP makes it easy for you with either the Kitty Kat or Poochie pack. Be sure to check those out because those are some great deals to get everything from this release that is on your list. Now head on over to Christine's blog for more wonderful inspiration and don't forget to leave some love along the way! When all that has been complete, why not join us in the new Anything Goes challenge for your chance at being a Swanky Stamper!! Thanks for hopping by! Happy Memorial Day! I hope you all are enjoying the long weekend. It's Feature Day over at Your Next Stamp and today, the DT is CASEing each other. That is always fun and you won't be disappointed in seeing all the fabulous creations made by the DT. My card was CASEd from Laura which you can find here for all the details. But this is my take on it. I used the new release set of Woodland Cuties for the image and sentiment. The patterned paper is from Studio G while the clouds and grass are from YNS - Puffy Cloud Duo and Chunky Grass. The outside panels were cut using the stitched rectangles die set finished with some fun Gumdrop embellishments. 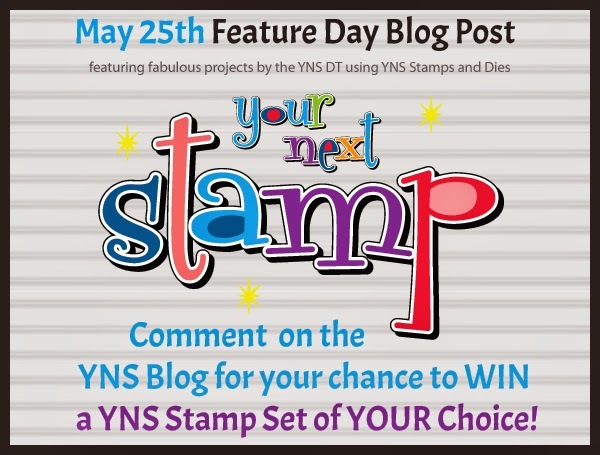 Be sure to stop by the YNS Blog for all the fun DT creations and be sure to leave a comment for your chance to win a stamp set of your choice! Thanks so much for stopping by and taking a looksie! Today's peek is all about the new release Cutable files and the one I am using is the super fun Shuttercard along with the ever cute Drop In set that will also be available. Head over to the TCP Blog for the full details on how this card is made. I used my Silhouette to cut the card and mats out. The blue background is actually some self adhesive linen paper from Dear Lizzy that I have had forever in my stash. The image was stamped and colored in with Copics while the balloon was paper pieced using some patterned paper from October Afternoon. It was then popped up as were the new release stitched clouds. 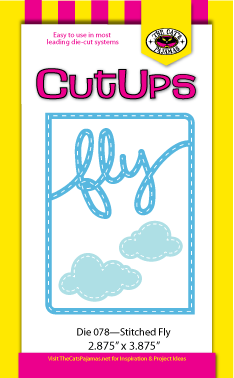 The word 'fly' is from the also new journal card die but I only used the word. There is so many options on how to create your own one of a kind shutter card with this Cutable file. Be sure to stop by the TCP Blog for more details on this and all the other new releases shown this week. And while you are at it, be sure to comment for your chance to win. Are you in it to win it? Don't forget about the pajama party tonight! I hope you all are having a great start to the long weekend! 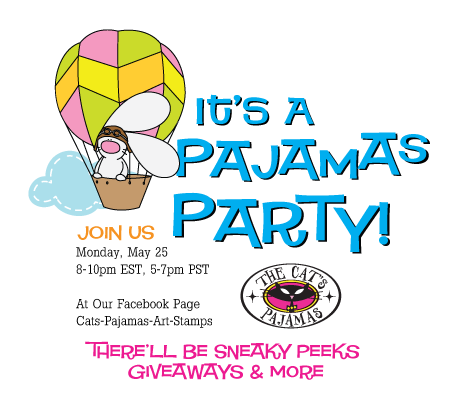 Today is Day 5 of The Cat's Pajamas Sneak Peeks. And this peek is adorable!!! In conjunction to this new set called Constellation Prize, I am using the new shadowbox Cutable File that will also be released. This shadowbox was so much fun to make and super easy. The best part is that it folds flat into an envelope to be mailed making it a fun surprise for your recipient. Once I made the front and back of the box following the Cutable instructions and my Fancy Flip Frames die, I added some glitter pen to the black backing for "stars." The image was stamped using Memento Black and colored in with Copics before fussy cutting it out to be added to the frame. The patterned paper is from MME. The stitched clouds (also to be released) were added to the frame along with the 3x3 star cutups. I stamped and cut out the sentiment to be hung down with twine. The card was completed with a few rhinestones for some bling. Really, a fun way to make and send a card! Don't forget to not only be IN IT TO WIN IT and comment over on the TCP Blog, but join us for the Pajama Party Monday night to kick off this fantastic release!! Thanks for stopping in! It's time for another Friday Sketch Challenge! This fun sketch is different and of course you do not have to follow it as is and make it round. Your take on what you see is what works! Thanks for popping in and don't forget to link up your project!! Have a great weekend! Happy Friday and that means it's time for another Your Next Stamp Fun Project!! Yes... the weekend is here and it is also a long weekend for most. I hope you have something fun and warm planned, but also keeping in mind the reason for this weekend. Please remember all those who have sacrificed for our country, past and present, allowing for our continued freedom. SO- let's talk about this project, shall we? This is a treat bag made using the new release set of Grad Kids and the new treat topper die (currently out of stock). The image was stamped with Memento Black and colored in with Copics. I then fussy cut him out to be popped up on the topper. I stamped the sentiment onto the topper and finished it with some yummy gumdrop embellishments. Not to mention the yummy treats in the bag too! I do love how this topper has a little handle at the top to make for easy giving or tying some ribbon for additional fun. There are many different treats that this topper can be used for. I do love it. That sums it up for me today. Thank you for stopping by and I do hope you have a fabulous weekend and Happy Memorial Day! 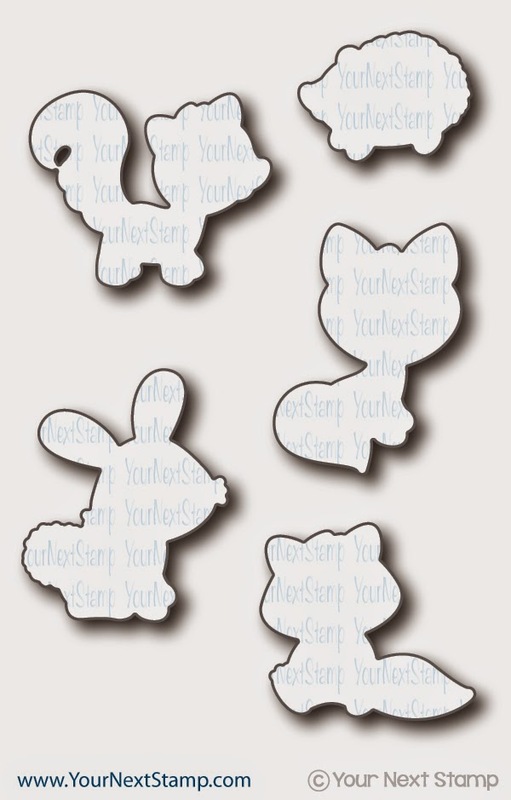 It's day 3 of The Cat's Pajamas new release sneak peeks and today's peek is a set I just LOVE! So much fun and many of us can relate to. It's called In Shape. Hee hee... Isn't he cute? I love all the sentiments this set comes with. For my card, I paper pieced the hammock and used the wavy stitched border die for the "ground." I used some birds from the die The Birds to pop up on the hammock sticks. A fun CAS look. 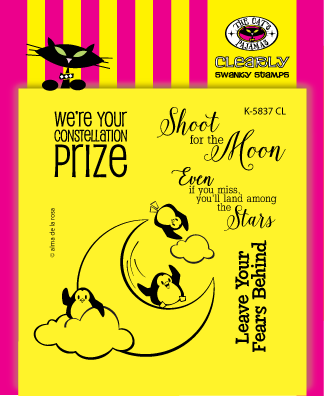 Don't forget to stop by the TCP blog to see all the fabulous Kitty Cat Pack's creations and for a chance to win! 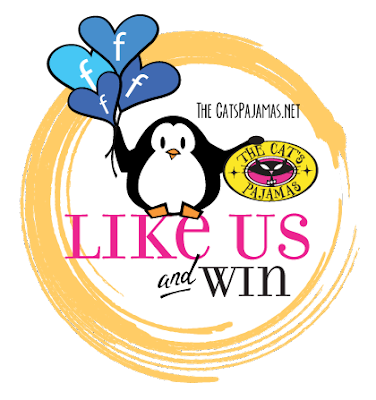 Winners are announced daily on our Facebook page. Don't forget to join us for our new release Pajama Party!! Details below. Thanks for taking a peek and have a great Thursday! 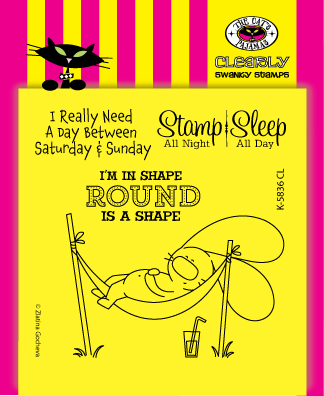 It's go time for the upcoming new release for The Cat's Pajamas Stamps! 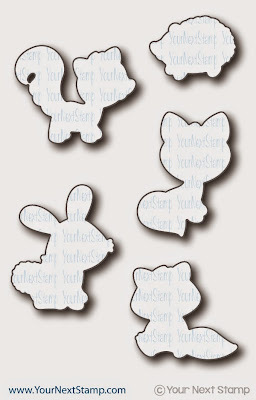 This whole week the Kitty Cat Pack will be showcasing the new releases for you to see all the fun that is in store. Today's sneaky peek is for a set called I Are Fun. How cute is this?! 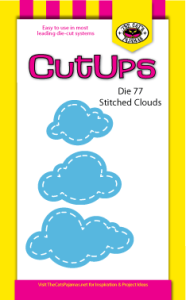 For my card, I also used the new Cut Ups of Stitched Clouds. These are fabulous and you certainly do not want to miss them! The image was stamped and colored in with Copics before fussy cutting him out to be popped up over the patterned paper from MME. The stitched clouds we placed around him while the sentiment is stamped, matted, and placed at the bottom. Thanks so much for stopping in and taking a peek. Be sure to check out all the other fabulous designs by the talented Cat Pack! I hope you are all having a great week. It is Wednesday, so that means the week is nearly over already. :) It is also time for a new DT Dare with Your Next Stamp. This latest release is full of fun and cuteness that you don't want to miss the awesome creations the team has made. The Dare is to use stitching and/or gumdrops on your project. The overachiever that I am, I have used both. HA! I am really not, but for today, I will say that I am for using both. The set I am featuring is the new Maki A Wish. 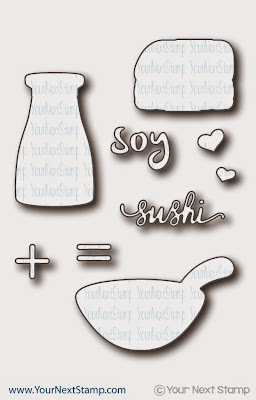 Again, for you sushi lovers, you do not want to miss this! 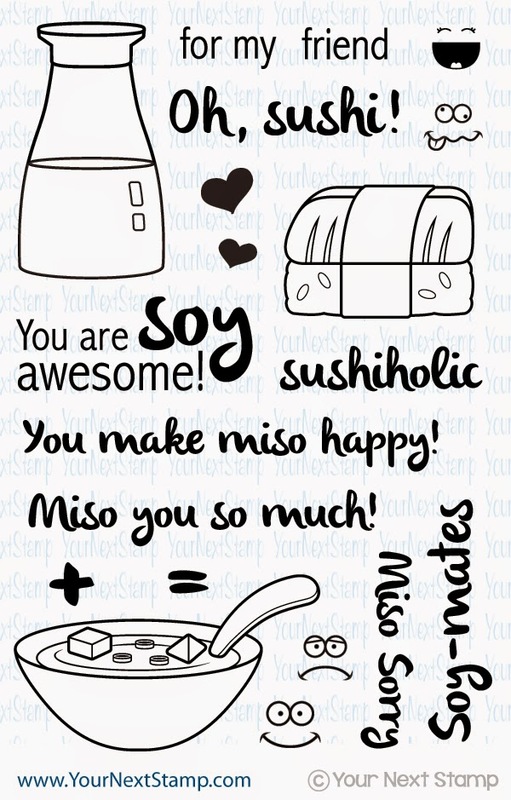 For this card, I used the sushi roll in the set and masked it to make more than one roll together. I think I should have done 4 rolls, but 3 is not bad, is it? I colored the rolls with Copics and popped up the panel. The sentiment was stamped and punched out with my basic circle punch and popped up as well over the patterned paper by DCWV. The patterned paper was cut out with the YNS stitched rectangles die and finished with some fun, yummy glittered orange gumdrops. Be sure to stop by the YNS blog to see all the fun creations by the talented team. Thanks for stopping by here today and hope you have a great day! 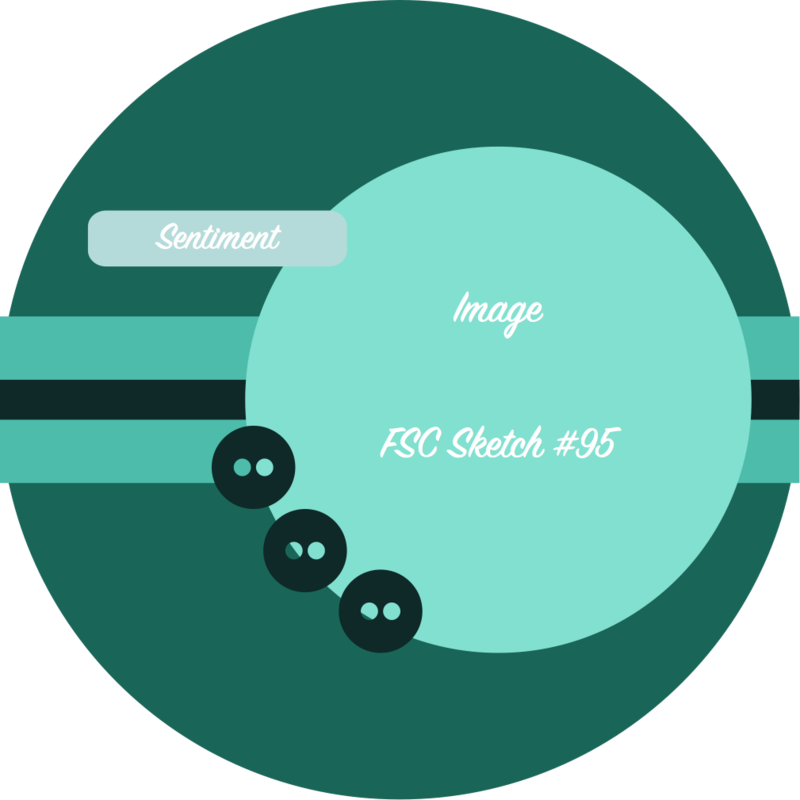 It's time for another TCP Tuesday challenge (TCPTUES290) and this time it is a sketch challenge. For my card, I used the last month's new release, and FREE stamp set of $60 or more, of Way To Go to create this card using my take on the sketch. How fun is this sketch? My card is a non-traditional size card of an A2 and made this one a 3 5/8 x 4 1/8. Perfect size for adding to a gift. I used some patterned paper I had in my stash that I believe I may have picked up in a dollar bin from Michael's. The image was stamped with Memento black ink and colored in the little bits with Copics. I then fussy cut the image and popped him up. Be sure to stop by the TCP blog to check out the rest of the DT's fabulous creations and to enter your project for a chance to win! Thanks so much for popping in and hope you have a great day! Are you ready for an outstanding, cute, and fun new release from Your Next Stamp? And are you ready to hop along for a chance to win? This release is full of so many fun and cute sets, you will want them all. 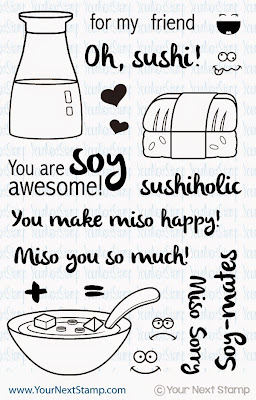 My two cards I am sharing with you are made using the super fun set of Soy Awesome. If you have ever been looking for a sushi set, this and another being released called Maki aWish is perfect! Seriously? How cute are these? Here is my second card using the same set and coordinating dies. Both card images were colored in using Copics and cut out using the Soy Awesome coordingating die set. I kept them CAS to allow for the fun-ness of the card to stick out. The images were popped up. Now no YNS blog hop would be complete without a fantastic sale to get you started in purchasing all the sets you've seen along the hop. 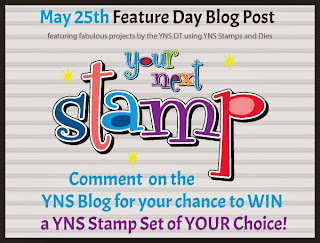 Thank you for stopping by and be sure to leave comments along the way at each of the DT's blog for your chance to win a $20 gift certificate to YNS. Have a great Mother's Day! Yes! It's release time again over at Your Next Stamp and you will just NOT want to miss out on this one. It is another fantastic release, but also unique and fun! Here, I made a CAS scenery card using the new release set and some other dies from YNS- Chunky grass, Seasons Whatnots, and Puffy Clouds. All of these make for a super adorable scene. I used some patterned paper from MME for the clouds while I used some scraps for the grass and sun and popped them up. The image was colored in with Copics and cut out using the coordinating dies. I told you! How CA-UTE is this set? So many fun creations can come from the set. And I know you will too will love this. Be sure to stop by the YNS blog to see all the wonderful DT creations and you will surely not want to miss tomorrows fabulous release hop! Thanks for stopping in and have a great Saturday.